This program has been developed to provide different levels of design services at reasonable fees to assist clients that might not be able to commit the financial resources for the full scope of services, yet wish to receive world class design by experienced members of the American Society of Golf Course Architects. J. Michael Poellot Golf Designs introduces a new and innovative approach to golf course design – our GOLF COURSE E-DESIGN program…………an ideal option for developers in the early, feasibility phase of project planning or golf clubs desiring to perform cost-effective golf course re-design or renovation. Conceptual routing of the proposed golf course including practice areas and maintenance facility. Identify areas of the site with additional development potential. Conceptual recommendation for siting of the clubhouse and overall major site circulation. Preliminary golf course construction cost estimate. 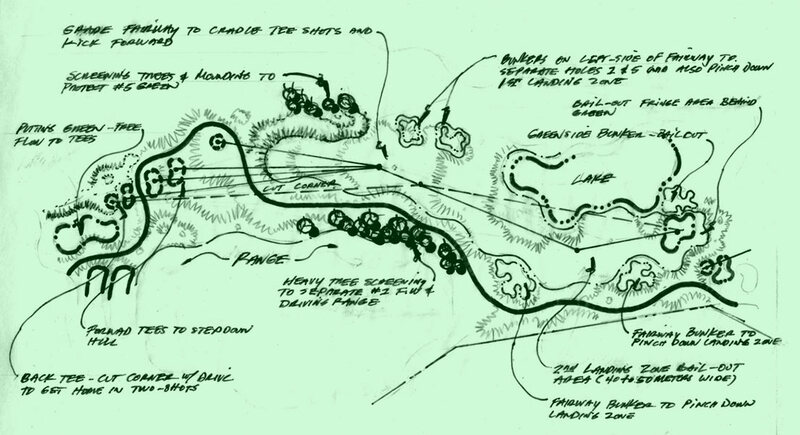 Conceptual sketches for the greens, tees and bunkers. Typical golf course construction specifications. Color rendering of the master plan for use in permitting and marketing. Developer to contact J. Michael Poellot Golf Designs through it’s website at: www.poellotgolfdesigns.com to obtain a Proposal and to send the initial retainer via Paypal. Developer to send J. Michael Poellot Golf Designs, electronically, a site topography map (@ approx scale of 1″= 200′ or 1:2500) clearly delineating the project property line and showing any existing site features such as buildings, roads, easements, etc. If available, the Developer may send an aerial photograph and any other site photos to assist the Designer in better understanding the character of the site. Developer to provide a written description of the developer’s vision and objectives for the project. Once the Developer has “approved” the initial conceptual routing of the golf course, the final payment is due and payable via Paypal. Should the Developer wish to proceed to subsequent phases of the GOLF COURSE E-DESIGN program, simply notify J. Michael Poellot Golf Designs of your intent to proceed and make the requisite retainer payment via Paypal. Of course, at any time through the golf course e design process, we are available to discuss your project in more detail via email or telephone to clarify any questions you may have.